Sporty fashion meets superb function. 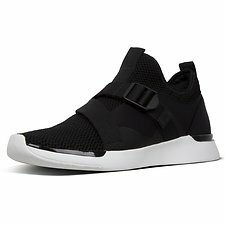 Sharp athleisure styling mean these pull-on sneakers look the part – check out the seamless 3D-textured engineered knit, neoprene side panels and sporty V-strap. While stretchy, light, breathable knit uppers and FitFlop's new lightweight Anatomiflex™ midsoles, with a hyper-flexible design and high rebound cushioning, make them amazing to walk in. (And 'must-have' in warm weather). Slip these on, and you may never slip them off.